Marie Greta Roy Clément, Minister of Public Health and Population in the presence of the National Directorate of Drinking Water and Sanitation (DINEPA) and technical and financial partners of the Ministry, presented the long-term plan 2018- 2022 for the elimination of Cholera in Haiti. Axis 4: Consolidation of the achievements of the fight: Water-Sanitation and Health. 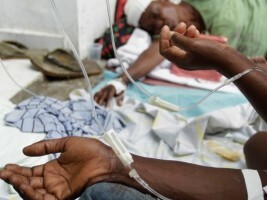 Thanks to the will and commitment of the Ministry, of health care providers, technical and financial partners, policy makers and the population, Haiti is now experiencing a significant decline in the incidence of cholera from 18.38 deaths per 1,000 inhabitants in 2010 to 0.02 deaths per 1,000 inhabitants in 2019.